Dates: 2015–detail will come soon. Situated in the middle of Asia, the Buddhist Himalayas is a cultural continent separated from other Asian cultures. 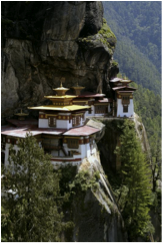 Bhutan has been one of the best preserved cultural islands within the Himalayan region. While other Himalayan cultures face great threat both from within and without, the kingdom is committed to preserving its culture at any cost. Until recently, Bhutanese kept foreigners away from its border in an effort to keep their culture undiluted. Now Bhutan has adopted a policy to let foreigners see its ancient culture and experience the beauty of the Himalayan mountains. Today, the Bhutanese are proud to tell outsiders that in their country, the Gross National Happiness is more important than gross national income. In 2008, the Bhutanese king stepped down to bring democracy to the country. The Bhutanese say it is the first time in the history of humankind a king voluntarily abdicated to give democracy to its people. Why should you join Tashi Delek Travel to visit Bhutan? Whether in Tibet, India or Bhutan, our strongest commitment is for our clients’ Himalayan cultural experience, spiritual discovery, safety, and comfort. With care and respect, we introduce you to the local culture with close and intimate interactions. A professional, bi-cultural and bi-lingual tour leader who can transmit the essence of the Himalayan culture, will accompany you. Our tour leader has firsthand experience in the cultural continent. Our group sizes are small. We make assessments about the participants to the best of our judgment so your group will be with like-minded people. We team with local guides and experts. The flight to Paro takes you over the Indian Ocean, the plains of India, and the mighty Himalayas. Upon arrival at Paro International Airport, your Tashi Delek Travel tour leader and a local tour guide will receive you and drive you to Thimphu, the capital city. Relax and let your body adjust to the new climate and altitude. Today, we will explore Thimphu, pilgrim sites, as well as historically significant monuments for Bhutan including the National Memorial Stupa, the Changgangkha Temple, the Zilukha nunnery, and Folk Heritage Museum where we will have a traditional lunch. After lunch, we will visit the Traditional Institute of Medicines and Tashicho Dzong. The Dzong houses office of His Majesty, the King and is the summer residence of His Holiness, the Je Khenpo (Chief Abbot of Bhutan) and the central monk body. After breakfast, we will journey to Trongsa via Dochula pass (10,000 ft). On a clear day, you can see the whole range of Bhutanese Himalayas. The pass itself is decorated with 108 Bhutanese style stupas and colorful prayer flags. This is one of the most amazing landscapes in Bhutan. We will then pass Pele pass (11,000 ft). This scenic journey takes about 7 hours. Explore the historical Trongsa Dzong where the royal family of Bhutan was the governor before Bhutan became a monarchy. We will drive to Wangdue to visit Chimme Lhakhang where barren couples are blessed. This temple is dedicated to the 15th century divine madman, Lama Drukpa Kuenley, whose radical methods of teaching religion has won a special place in Bhutanese hearts. 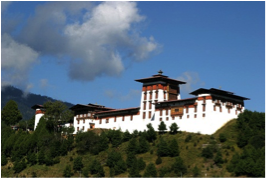 We will visit the Punakha Dzong, the winter residence of His Holiness and the monk body. The wood carvings create a serene ambience. The Dzong was built in 1637 but renovated a few years ago. We will return to Paro in the evening. he flew here riding on the back of a tigress. In the afternoon, we visit Drugyal dzong though in ruins played an important role defending the valley from Tibetan invasion. We return to Paro town where we visit the 7th century Kychu Temple, built by the Tibetan King Songtsen Gambo. For dinner, we visit a traditional farmhouse and enjoy a typical Bhutanese dinner with the family.